Recently, OSHA decided to start evaluating the Refuse and Waste Collection Industry on the same grading basis as the food industry, assigning grades dependent upon injury and illness reports. In 2013, 33 workers died. 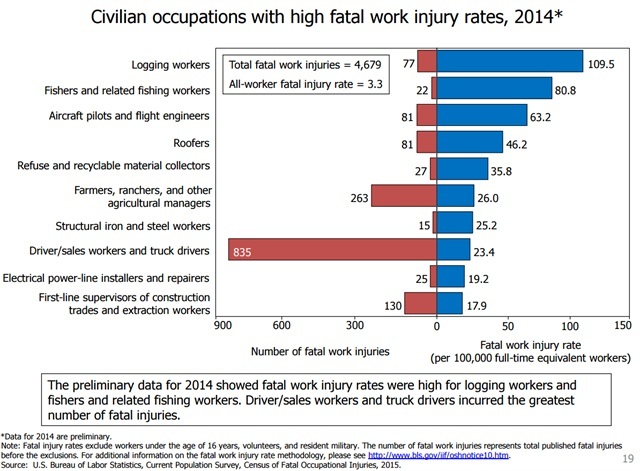 In 2014, 27 workers died. However, because there were less workers in this industry, OSHA states this to be a ‘death-rate’ increase of 2.8%. While industry experts and organizations like SWANA are speaking up in favor of the potential OSHA enforcement, one wonders how much increased reporting is going to cost the industry and what new regulations will be imposed that might restrict the industry from being efficient. OSHA is continually looking for ways to fund its existence and one wonders if this is guiding their current rulings. A review of the high fatality industries shows that while each one is highly regulated already, each requires an incredible amount of independent thinking and behavioral cognizance. Many workers are in their own right, a supervisor. The working conditions are ever changing, not constrained, and usually call for on-the-spot decision making. If, perhaps, OSHA imposed a regulation that a vehicle could not ever drive in reverse gear, then the impact upon haulers and commercial facilities would be tremendously negative. Certainly one life lost is too many, but regulation must be looked at realistically and with input from the haulers and TSDF’s around the country. Industry customers placing pressure upon facilities to improve safety operations due to grades given would be the free market taking action. However, OSHA requiring specific changes through regulation would not be.